Healthcare will no doubt shape the future of our country. And, if iRobot and InTouch Health succeed, robots may shape the future of healthcare. As Greg Huang wrote in September, iRobot has entered the healthcare field with the RP-VITA (Remote Presence Virtual + Independent Telemedicine Assistant), a robot it hopes will improve patient care by, among other things, removing geographic barriers—so that a doctor might treat a person on the other side of the world, or “visit” a patient’s home instead of making the patient come to her. Want to see this new technology for yourself? 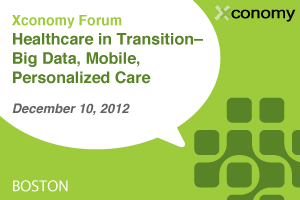 Join us for the Xconomy Forum: Healthcare in Transition, where Colin Angle, Co-founder and CEO of iRobot, and Yulun Yang, CEO of InTouch Health, will be presenting a live demo of the recently released RP-VITA. This event will be held this coming Monday, December 10, from 2-5:30 pm at the Microsoft New England Research and Development center in Cambridge, MA. Joining Angle and Yang as keynote speakers are Bryan Sivak, CTO of the U.S. Department of Health and Human Services, and Stephen Wolfram, Founder and CEO of Wolfram Research and creator of Mathematica and Wolfram|Alpha. We also have a number of great panelists, including atheanahealth Chief Medical Officer Todd Rothenhaus and Xerox CTO Sophie Vandebroek, just to name a few. You can find more information and register for the event at our Eventbrite site. We only have a few tickets left, so reserve your spot today. Health care is most important one issue to all of and it’ll helps us a lot to keep well our health. But, the robots may shape the future of health care writing is very delighted to me. essays writing services is able to provide us high quality education writing services. Health care is most important one issue to all of and it’ll helps us a lot to keep well our health. But, the robots may shape the future of health care information is very delighted to me. essays writing services is able to provide us high quality education writing services. Well, I hope that it’ll be implemented in a few years. It’ll be a breakthrough and will give huge opportunities. My colleagues from Assignment Mountain was at the forum and said that the robot looks promising.